One day in a discussion with my parents I referred to an event from the 1940’s as happening during the “black and white days” because most photos, films, and newsreel footage of that time are in black and white. I am still surprised when I see color films of World War 2 and the effect it has on my connection to that terrible event. The term “living color” is truly appropriate because seeing the persons and events of this the greatest conflict in history in color makes them seem more alive and real. I had the same feeling watching the highly anticipated Steven Spielberg film “Lincoln,” except it was not just the clear color picture that made the martyred 16th president seem more alive, it was hearing his voice, that scholars believe matched the high-pitched tenor offered by Daniel Day-Lewis, and encountering a personality, that included humor, passion, determination, compassion, and tenderness. Based in part on “Team of Rivals,” the best-selling book by Presidential historian Doris Kearns Goodwin, “Lincoln” is the account of the President’s fight to get the 13th amendment outlawing slavery in the United States passed before the end of the war. The President felt a sense of urgency because he believed it was less likely the amendment would be approved after the war was over, and was afraid the Emancipation Proclamation might be overturned once his Presidential war powers were suspended following the war. Resisting tremendous pressure from inside and outside his cabinet and family, Lincoln decided to push for the amendment’s passage even if it required a delay in the war’s end. Left unstated, but felt throughout the film was the reality that had President Lincoln not put forth and fought tooth and nail for this amendment, and had not the House joined the Senate in approving it, then the entire national nightmare and tragedy that was the Civil War would have been for naught. One could feel upon Lincoln the weight and burden of the deaths that would accompany a delay in pursuing peace and the surrender of the South, yet allowing the cruel institution of slavery to remain in any portion of the nation was an even heavier burden. Under the most challenging of circumstances Lincoln was walking the narrowest of lines between what was best for the nation at that time, and what was best for the nation from that time on. 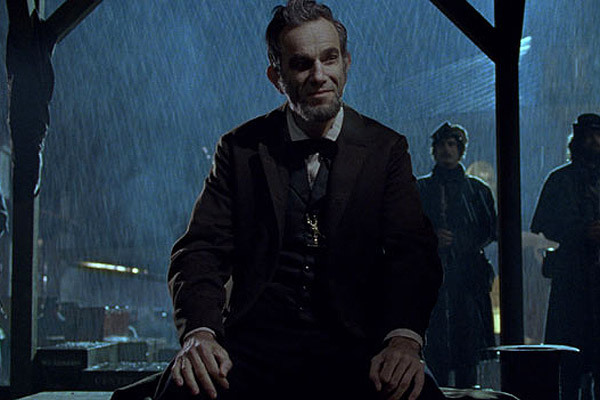 Daniel Day-Lewis offers a performance for the ages, revealing an emotional arc that ranges from a whispering, tender father playing with his son to a determined leader passionately commanding wavering cabinet members to show courage in the quest of righteousness. Steven Spielberg’s pitch perfect direction effectively captures the tired, rough edged living that one imagines was the nation at the conclusion of the deadliest war in the nation’s history. Each member of the steller cast effectively portray characters who were worn, tired, and wearily unkempt from years of strain, stress, and sacrifice. The spirit of the President and the Lincoln family, his cabinet, Congress, and all in Washington was frayed, even as the war’s end and victory was inevitable and in sight. In our post film discussion, my wife Michelle and I had identical reactions from the film in light of current events. Both of us felt sad and ashamed for all of the talk about secession that has been in the news since the national election. After watching the film and experiencing vicariously the slightest degree of the suffering experienced by those who fought, were injured, and died during the Civil War, these petitions are an insult to the memory of those men and women and their families. Most of those who participated in, supported, or even entertained the idea of their state seceding, did so in reaction to what they consider is a tremendous threat to the nation, yet their remedy would break the nation apart. The irony is that many who profess patriotism and love of nation most fervently were those who participated in, or were sympathetic to, this political expression that was directly contrary to the fabric of the same nation. Regardless of political belief, victory or defeat, as an American one is called to accept and work within the political process. To do otherwise is by definition, “un-American. Politics is not the only setting where such dichotomy exists. Such dissonance between expressed thought and action echoes those who profess belief in, and love for, Christ and who desire clerical leadership to preach “The word” yet balk at the preaching and living out parts of such Word that challenges all followers to change the way they think and act. Common to all who profess the Christian faith and have a relationship with God is the acknowledgement of one’s fallen nature, need for change, and repentance. Jesus’s Sermon on the Mount, for example, demands followers of Jesus to love enemies, without qualification. Many however, who want “the word” preached instead follow the worldly practice of seeking vengence or harboring resentment and then offer criticism of those who call them to hold to the teaching of Jesus. A similar example is one who judges one who proclaims Jesus’s call not to judge? Such inconsistancies indicate the difficulty of repenance from the ways and practices of the world and to the desire of God and ways of God’s Kingdom. I have known clergy who have received intense criticism and been removed from churches for challenging congregations to follow these and other commands and teachings of Jesus. Certainly members of churches in the United Methodist and other traditions do not have to agree with every statement and thought offered by preachers. Clergy make mistakes. Clergy preach bad sermons. Not all have clear or correct theological understanding. Preachers need to hear when sermons and statements have parts that are confusing or contain errors in Biblical interpretation and theology. They should not however be uncritically judged or blanketly labeled when they proclaim the most challenging portions of the Gospel and are genuinely seeking to live up to both their baptismal and ordination vows to make disciples and proclaim scripture. As with the shepherd who could account for 99 out of 100 sheep, all Christians have work to do in living out and proclaiming in word and deed the challenging message and calling of Christ. It is the job of ministers, lay and ordained to lift up this reality before followers of Christ. I do not consider myself a prophetic preacher, yet I have tried in conjunction with my baptism and ordination to proclaim prophetic portions of Scripture and the entirely prophetic life and teaching of Christ. I am not under the illusion that I do so with anything but modest ability, but I have tried, and I have received criticism for delivering this word. While I am not surprised with receiving such critique / hostility, as almost all preachers of the Gospel have received similar antipathy when presenting the Gospel call to change thoughts and actions, it is disheartening, even in the relatively minute amount I have experienced. I cannot imagine the toll the infinitely greater criticism and indeed abuse Abraham Lincoln received when he sought to live out and up to the oath he took to serve the nation and constitution and prophetically lead this nation through the darkest of times. Through the film “Lincoln” my estimation has increased from black and white vagary, to “in living color” awe. This entry was posted in Faith Shots, Film Shots and tagged 13th Amendment, Abraham Lincoln, American Civil War, Civil War, Congress, courage, Daniel Day Lewis, discipleship, faith and film, fiscal cliff, Lincoln 2013, LIncoln film, political courage, prophetic, secession of Texas, secession petitions, Sermon on the Mount, slavery, Steven Spielberg. Bookmark the permalink. Reverend, I am good friends with your fabulous wife! I ran across your writing when TSims shared it on facebook. I just need to tell you how beautifully written this is and how right on! Thank You! Rick and I are going to see the movie on Friday! Thanks Tracie. I took our son to see it today and it was just as good or better the second time. Daniel Day-Lewis is tremendous.. I might suggest you google the 13th amendment to brush up on some of the history. I will tell Michelle hello. Thanks again for your kind words.